Find out more about our BigCommerce web design, custom programming, and marketing services. Contact us below. Coalition Technologies works with a variety of e-commerce Content Management System (CMS) platforms. One of the CMS platforms we regularly use is Bigcommerce. In fact, Coalition Technologies is one of a few Bigcommerce certified marketing partners. We were selected by Bigcommerce for the exceptional work we produced for clients using their platform. If you are interested in using Bigcommerce to meet your e-commerce needs, then you’ve come to the right place. As a CMS platform, Bigcommerce allows users to create powerful e-commerce based websites and has a variety of features for those users that help oversee the business conducted on the site. An important benefit of Bigcommerce is that they make it easy for websites using their platform to be optimized. Search engine optimization (SEO) is imperative to having a successful business on Bigcommerce. Coalition Technologies has worked with multitudes of clients on this platform and we have worked with a multitude of clients on this platform, and we have been able to increase each client’s site traffic and conversion rates. This is because the SEO specialists at Coalition Technologies are extremely knowledgeable about how the CMS platform interacts with search engine algorithms. This knowledge enables us to customize the Bigcommerce platform with search engine optimization in mind. Working within a CMS platform’s framework is different than simply optimizing a regular site. As a result, it is a lot more technical to optimize a Bigcommerce site than one that did not need a CMS. As an SEO firm, Coalition Technologies will setup your Bigcommerce site with search engine rankings in mind. After all, having a website that gets little to no traffic does your business little good. Our team will setup your Bigcommerce website, so it gets as much traffic as possible, and subsequently, conversions. In fact, we can create a site on this platform that can generate revenues around the clock. Our Big Commerce Portfolio. Click thumbnail to view. Having a non-certified company try to optimize your website on the Bigcommerce platform carries considerable risks that could have damaging effects on your business. The CMS platform requires its own technical attention, and there are some aspects, which if even slightly altered or changed, could be detrimental to your metrics. Thankfully, Coalition Technologies will implement and oversee your Bigcommerce website in the manner that will be most beneficial to your business. Bigcommerce has a ton of features and abilities that can really help you run your e-commerce business. It is one of the biggest CMS providers and is widely popular in the business world for its convenient solutions. The power of that platform, coupled with Coalition Technologies familiarity with the marketing side of Big Commerce, has served our clients well and has resulted in revenue growth for their businesses. 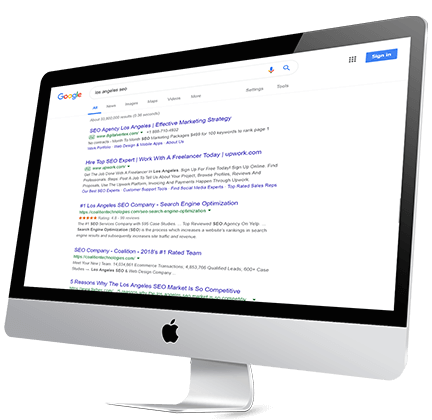 Search engine optimization is one of the primary services we offer here at Coalition Technologies, and it is something that we are very good at it. We have a team full of SEO specialists who are committed to increasing your site’s authority and rankings. Let us apply the power of that expertise to your Bigcommerce needs. Coalition Technologies isn’t just another SEO agency. Our team of Los Angeles SEO experts works full-time to optimize every facet of our clients’ websites, both onsite and off. Our SEO professionals are some of the most knowledgeable & experienced in the industry, and we deliver real results for our clients time & time again. For instance, at Coalition, we don’t simply follow the current SEO trends. Our team constantly researches the latest Google algorithm changes and conducts elaborate tests to determine the latest SEO developments. This allows us to constantly stay ahead the curve. We recognize that SEO is an ever-changing enterprise, and we’re always ready to adapt to those changes. Contact Coalition Technologies today for a conversation about how we can help your business.